LinkedIn is the world's largest professional network with more than 610 million users in more than 200 countries and territories worldwide. Most LinkedIn active users keep their profile up to date so recruiters can match them to the right opportunities. Dynamics 365 for Talent Attract customers can now allow their candidates to apply for jobs through the Attract career site using “Apply with LinkedIn” functionality. 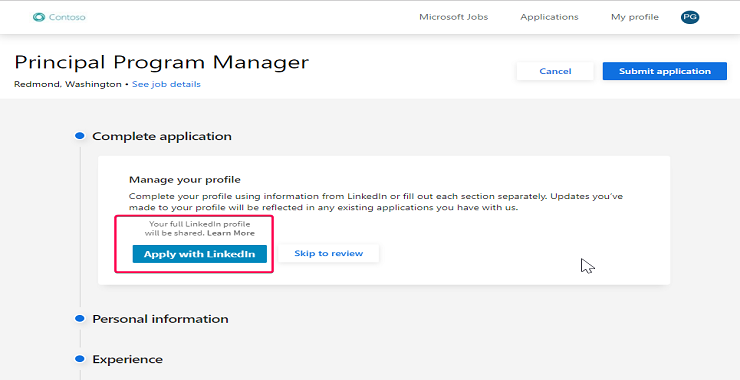 Once the integration is setup by the Attract administrator, candidates will now be able to easily use their full LinkedIn profile to auto-fill applications for jobs within the Attract career site. This capability streamlines the application for the candidate providing latest and relevant information about themselves. Additionally, for the hiring organization, “Apply Starters” helps to keep track of candidates that started their application with LinkedIn data but do not submit the application. Apply starters is available in LinkedIn Recruiter as we work on adding Apply starters explorers widget in Attract. To set up “Apply with LinkedIn” integration with Attract, please click here. If you have any feedback or ideas for how we can improve the product and its capabilities, please submit an idea here or leave a comment below.